This game is a battle of two teams headed in the opposite direction. The Bulls are looking to break their losing streak and move on without Derek Rose and the Pistons are looking to keep their winning ways going. Since losing Derek Rose to injury late last week, Chicago has suffered two losses after winning their past five games before that. The Bulls are now 6-7 on the year after back-to-back losses to the Clippers and the Utah Jazz. The Clippers are one of the better teams in the league, so that is understandable, but the Jazz boast the league’s worst record. At 6-7, the Bulls are still much alive this season but will need to rely on someone else to score with Rose now sidelined for at least the rest of the season. 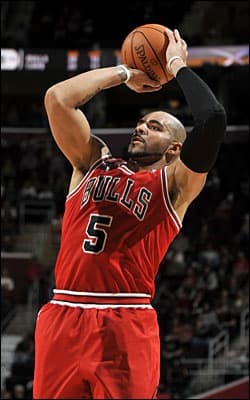 Carlos Boozer and Luol Deng may be the guys to add that scoring punch. The veterans scored a combined 50 points and grabbed 26 boards in the 89-83 loss to Utah on Monday. The Pistons welcome the Bulls to town after posting back-to-back wins for the first time this year. Point guard Brandon Jennings led the way in Monday’s victory against 113-94 against Milwaukee on Monday. The veteran guard scored 15 points and dished out 13 assists in the win. The speculation nationally is that these Bulls are done and just about everyone is counting them out after Rose’s injury. It is true that they have looked miserable in their past two games, but I think they rally in this one to get the win. Chicago is a veteran team, and they know they can put it together much better than they have in their past two contests. Detroit have looked so far like they are at least an average team in this league, but their wins over the Bucks and Nets are not exactly landmark wins. This line opened at Detroit -3.5 and is now at -4 at most sportsbooks. The public likes Detroit in this game, so we may be able to find an even better price if we wait closer to game time. LeBron James and the Heat head to Cleveland as James faces off against his former team and hometown Cavaliers at Quicken Loans Arena. Miami comes into Cleveland playing their best basketball of the year, on a seven-game win streak. A big reason for that is reigning MVP James, who is shooting 61 percent from the field, 49 percent from three-point land and 80 percent from the charity stripe. These are all career best numbers for LeBron if they should hold up till season’s end. The Heat at 11-3 on the year after beating the Phoenix Suns 107-92 at American Airlines Arena. James once again led the way in points scored, putting up a game-high 35 points in the win. The Cavaliers had high hopes coming into this season with their young but talented roster. They at least hoped to be a playoff team, but so far it has not looked that way. At 4-10, the Cavs have lost six out of their last seven games. With a lack of scoring punch and Andrew Bynum’s limited contributions in the paint, Cleveland does not have that go-to scorer that can create his own shot. Point guard Kyrie Irving is the franchise player of the future, but he needs more help. The Cavaliers last game was Sunday, a 126-96 away loss at San Antonio. This series has been one-sided as of late, with the Heat winning all four matchups last season, but it is worth noting that all of these games were decided by four points or less. The Cavs are not a good team by any stretch but always seem to play hard against James and Miami. 9 points are an awful lot for how these games have gone recently, especially with similar rosters facing each other. This one should be close. I will be rolling with the Cavaliers at home. The Pacers have quietly emerged as one of the NBA’s top teams over the past few seasons. They head to Charlotte on Wednesday night looking to improve on their franchise’s best start in history. Indiana is going for their 13th win their past 14 games. Their winning ways have been sparked by their defense which is the best in the league in a number of categories. The Pacers lead the NBA in scoring defense with 94.4 points per game and are tops in defensive field-goal percentage with 39.2. Forward Paul George also looks to be one of the game’s newest superstars, averaging 24.3 points per game and playing lock-down defense. The Pacers have been beating everyone this year and notched their record to 13-1 with a home win against the Minnesota Timberwolves on Monday. Charlotte has played better basketball than most are used to this season and are on pace to have one of the better seasons in a number of years. That is sad considering their 7-8 record, but a testament to how terrible this franchise has been over the past five seasons. The Bobcats have strangely played much better on the road this season, rather than at home. They continued to struggle at home on Monday, losing to Boston 96-86. They have dropped five of six at home this season. Kemba Walker led all scorers in Monday’s loss, a game that the Bobcats hoped that would catapult them over .500 but instead dropped them below the mark. It was their fourth loss in six games. There is not much to this game in my mind other than the huge difference in talent between these rosters. Indiana should have a field at Charlotte, especially considering their flaccid home efforts this season. 8 points is not much to lay with Indiana, who regularly win by double-digits even if their style of play is not conducive to blowouts.